Hopefully it is smooth sailing from here. I only have about 6 more things to do before I can officially say my finals are over and begin a well deserved break from school. Also this will be the last project I do about the bar for AWHILE! I do not know what it was about this semester, but I did a lot of projects on the bar. 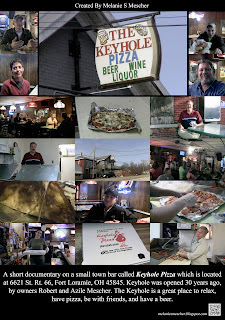 Keyhole Pizza Documentary from Melanie Mescher on Vimeo. 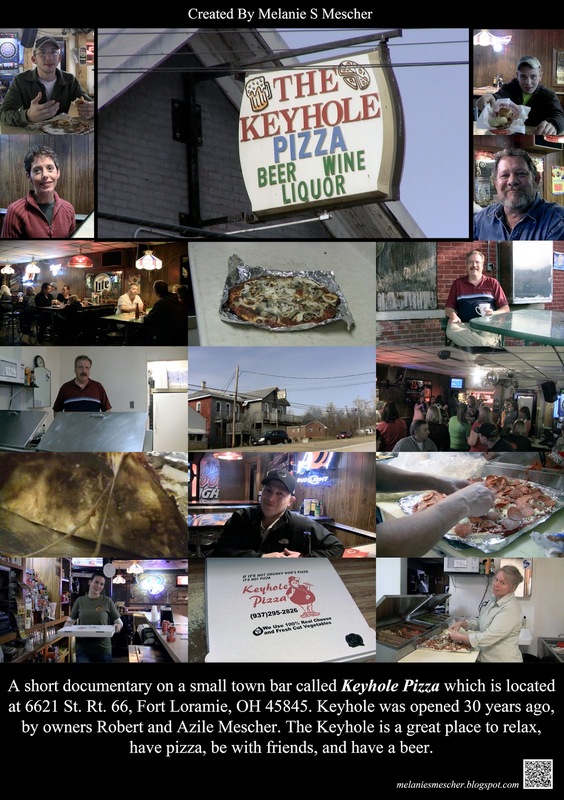 A short documentary on a small town bar, Keyhole Pizza which is located at 6621 St. Rt. 66, Fort Loramie, OH 45845. Keyhole was opened 30 years ago, by owners Bob and Azile Mescher. The bar is locally famous for their pizza, and has made pizza for about 27 years. The Keyhole is a great place to relax have pizza, be with friends, and have a beer or a few. Overall, I am pretty happy with the results of this video. I wish I could reshoot some of the scenes, but I only had a small window of opportunity to shoot. Some of the audio for the interviews are a little spotty, and I wish more people would of allowed me to film them. So I hope you enjoy this insight into the Keyhole. Love the video! My wife, Heather, & her sister Anissa are in it. I shared it on my Facebook page.